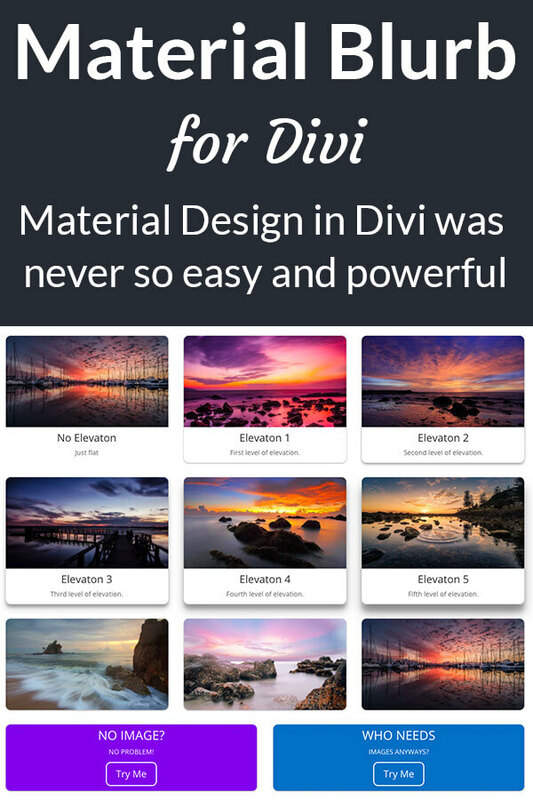 Material Blurb for Divi has 3 main features: Image, Text and Call to Action. Every part of the Blurb is optional and highly customizable – but there is even more. Material Blurb for Divi implements the popular Material Design. It’s up to you to choose which components you use. You can mix them as you like. But thats not all. You can add a second image which gets shown when hovering over the module. This lets you create incredible designs – for example by adding partly transparent overlays. Material Design Elevation does not change the size or position of the blurb. However, in some cases you might want to do exactly that. So we implemented custom hover animations as well to make the blurb under the mouse really pop. 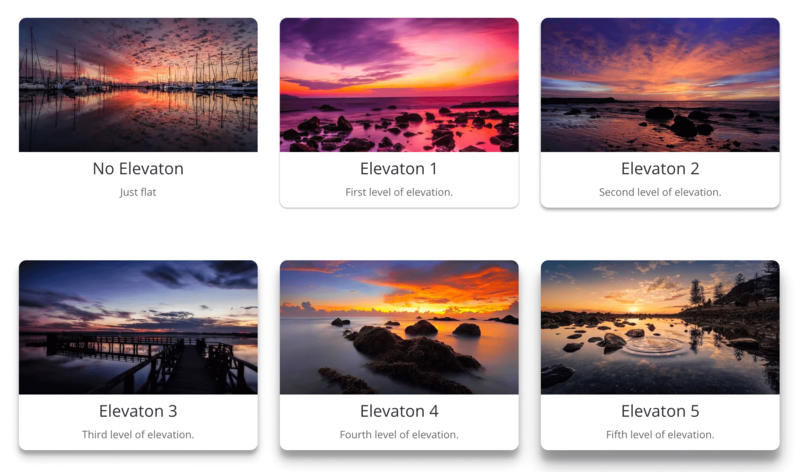 From the heading to the button alignment to the border – you can customize every aspect of the module directly in the Divi Builder. And if the all the buttons and sliders are not enough, there is a custom CSS field for every div. With the Single Site License you can install and activate the module on one site. With the Unlimited Sites License, you can install and activate the module on as many sites as you like – perfect if you are a freelancer or a web design agency. You can deactivate a Single Site License and remove the module from your site if you decide to use it on another site. All licenses are lifetime licenses. That means that you will get free updates forever. We have great plans for Material Blurb for Divi. On our todo list are several points on which we are working and which you will get for free with the next updates. More animations. Are there animations you would like to see? Feel free to tell us! Design library. Preconfigured blurbs and rows for your convenience. Smarter defaults. Add switches for page wide defaults in the Module Customizer. Ich habe mir vor ein paar Tagen das plugin gekauft und installiert. Es funktioniert super. Ich wollte noch eine Zusatzfunktion, habe Jan geschrieben und prompt eine Antwort bekommen und das an einem Samstag!!!. Ich bin begeistert. Ganz herzlichen Dank Jan. I bought and installed the plugin a few days ago. It works great. I wanted an additional function, wrote Jan and promptly got an answer on a Saturday !!!. I’m excited. Thank you very much Jan. Thank you so much for your responsiveness, and willingness to help me through my recent difficulty with inadequate memory, when I thought that it was this plugin. Though my site is still down for some other maintenance, it is fixed! I really appreciate someone who backs up their product. You were right on it. And your product, Material Blurb, is terrific! When will it be possible to edit features of this plugin using the Visual Builder? The good news is: you can already edit the plugin in the visual builder – you just can’t see the preview right on the page yet. I’m working on migrating all my plugins but it takes a lot of work and time. Fantastic plugin. Run into a bit of the issues in regards of configuring the plugin but with a help from Jan everything went very smooth. Great plugin even greater support. Cheers. Jan, thank you very much, the customization of the size of Material Blurb works perfect according to the “How to equalize blurb heights”, this is one of the problems when the text is not the same size inside the Blurb Material Container. When we buy a product on the internet, we expect it to meet our expectations but it is also important to support the product and for my Blurb Material you have both 100%. I bought the Material Blurb for Divi and it works great! I need a slight tweak, so I sent Jan a question in the contact form on his website. He replied very quickly with an updated plugin to test, which worked perfectly. Excellent work! Excellent customer service! Bought the Material blurb installed it and it worked fine. I needed to make the image overlap the container so I contacted Jan. His response was fast and solved the problem. Really, I could not be more impressed with his customer service (and patience). I will not hesitate to buy other products he may offer! 1. How do I link the blurb image to open a large image instead of a link to another page or image ? Im trying to use the blurbs in a portfolio. 2. The license is a little confusing. I bought a lifetime license for your plugin, but the expiry date on the elegant theme shows a year from now in 2019. Can I still download and install the new upgrades on new sites after Feb 2019 ? Hallo, this Plugin looks really cool, it it also possible to place Icons between Picture and Text like you can see it on this site here? , and i could easily customize my page only with this module. Let me clarify the above. I can change the font settings in the Material BlurbModule but they don’t show on the live site. I can’t seem to customize the header and text fonts sizes in the Material BlurbModule. It appears that the Divi theme is overwriting these settings. When we try to initiate the updater for the module, it states, that the Elegant Themes API key or Userid is not correct, but it is. Hi This is a common conflict in some WordPress installations. The API we use is completely different. May I ask you to re input your ET API key, save and then log out and in again to get over this issue. Hi Andrew, thank you for your answer. I will do this, but, since I thought I only need to ask for a Material Blurb key, I did already do the 1.6 update manually (deleted the plugin and uploaded the new one). But for the next update I’ll try to do the reinput solution. Also I wrote to Elegantmarketplace asking for a licence key for the Material Blurb Module. I have bought your plugin and activated it but it is not visible in the in the Divi Builder. I have already cleared cache several times, but still not there. any idea what could be the reason ? as all custom Divi modules, Material Blurb does not work in the visual builder. You have to use the old backend builder to configure the module.